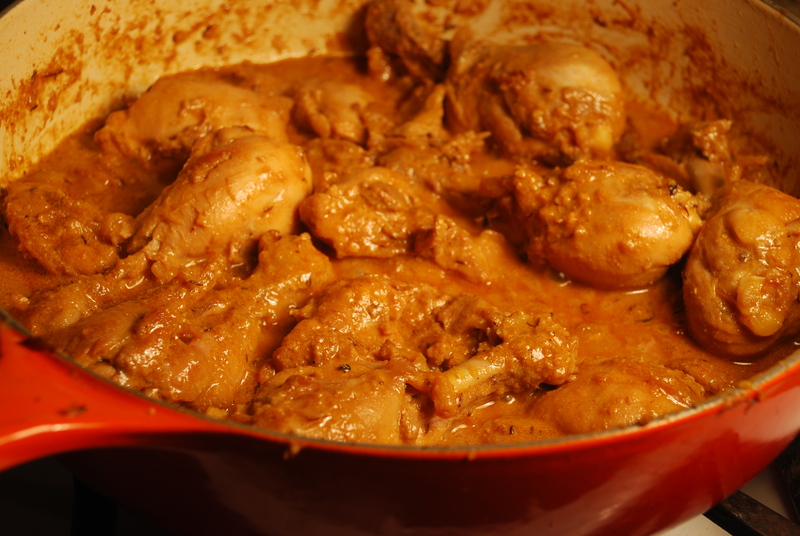 So its been ages since I posted on the blog, but I am back with a cracking recipe for the infamous Karhai Chicken! At the end of last year I was focusing mostly to study for the CFA exam and really did not blog at all but was cooking and taking pictures so have a lot of recipes to post! This recipe has no onions in it and once you get it going to the point of adding the chicken in, you pretty much just stir once in a while till the oil separates from the tomato gravy. 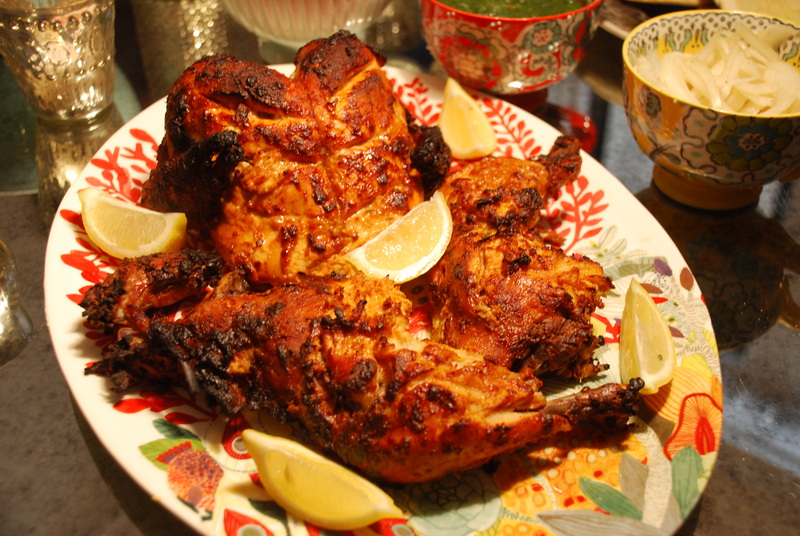 It is a truly sublime recipe to be devoured with some tasty tandoori roti or a nice buttered naan! Please try this, it is really not one you want to have missed. Now for this recipe the real deal is to make it in 7 tbsp of ghee but I like to use 2 tbsp so I get the ghee flavor and then make up for the other 5 tbsp with vegetable oil. And I think it totally works with keeping the calories a bit lower. Anyway feel free to use only oil if you have no ghee, it will still be amazing, and I usually just do that. It has been sub zero temperatures in New York and I have really been having the hugest cravings for good warming Indian dishes. I made Dum Aaloo, and a very tasty easy and quick mushrooms and pea dish along with this. So I look out for those soon too. 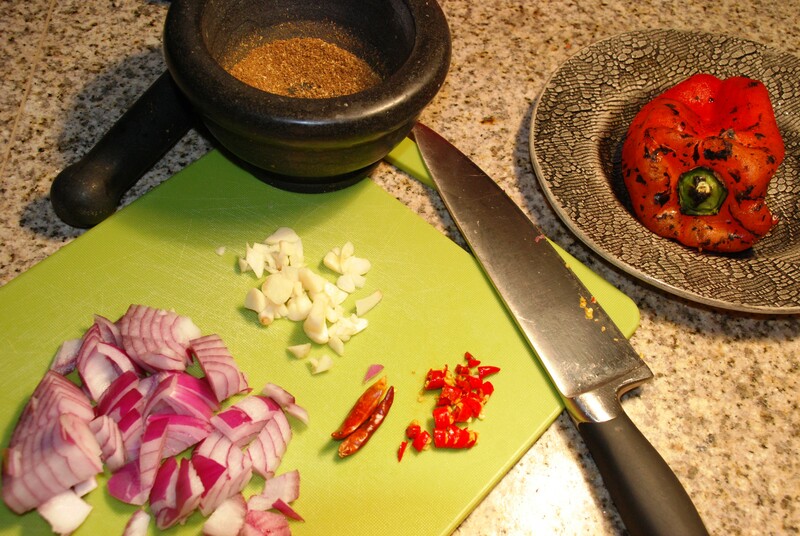 In a pestle and mortar grind the coriander seeds and red chillies. 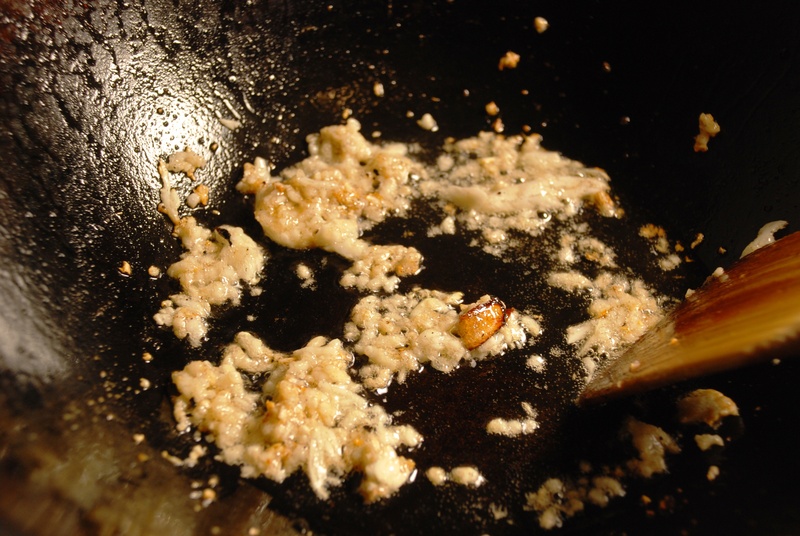 Heat ghee/oil in a pan, add garlic paste and sauté over medium heat until light brown. Add the dry spices, stir for 30 seconds, add tomatoes, bring to a boil, add green chillies, ginger and a third of the chopped coriander (use the chopped stems here), reduce the heat and simmer for 4-5 minutes. 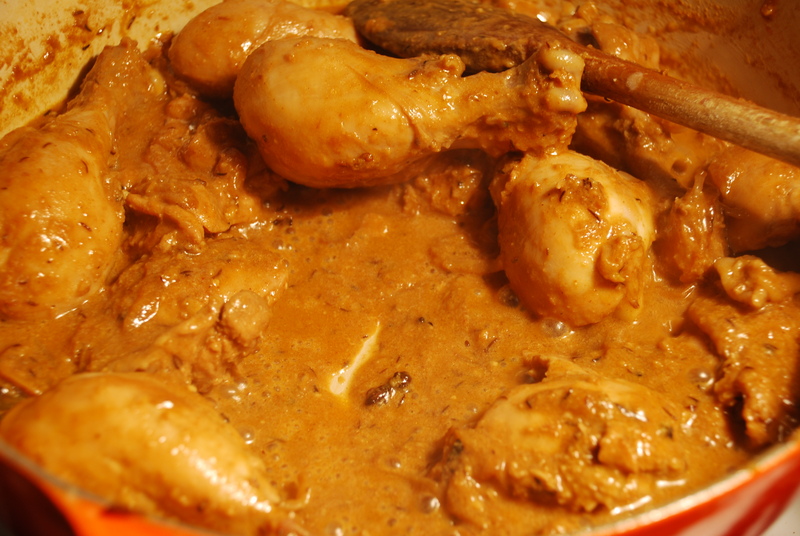 Add chicken, bring to a boil, simmer, stirring occasionally until the fat leaves the masala, the gravy becomes thick and the chicken is tender. Sprinkle garam masala and fenugreek leaves (which have been rolled in your hand and crushed over the chicken so they release their aroma) and stir for a couple of minutes. Adjust the seasoning. 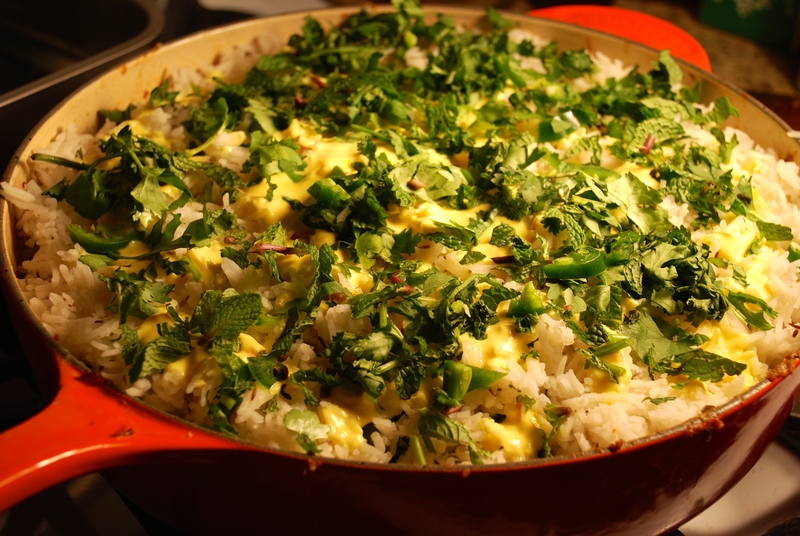 Garnish with remaining chopped coriander and serve with Indian bread of your choice. This Sofyani Biryani is one of the most divine tasting biryani’s ever! Now there are a lot of different biryani’s out there and I have many that I love. This one is right up there in the top three. It is Hydrabadi and is delicate in flavor. The saffron mixed in yogurt drizzled over the rice, renders it with beautiful specks of gold and an aroma that is to die for. You really taste a very gorgeously fragrant combination of spices intermingling with the notes of lemon. I had eaten this type of biryani before but never knew how to make it, lucky I decided to try out this recipe from my favorite book “Prashad, cooking with Indian Masters” and the results were spectacular!!! The flavors are really unique and you must give it a go if you are a biryani lover. You will notice this recipe calls for shah zeera or black cumin which is a more delicate flowery variety of ordinary cumin it is thinner, darker and sweeter than its ordinary cousin. 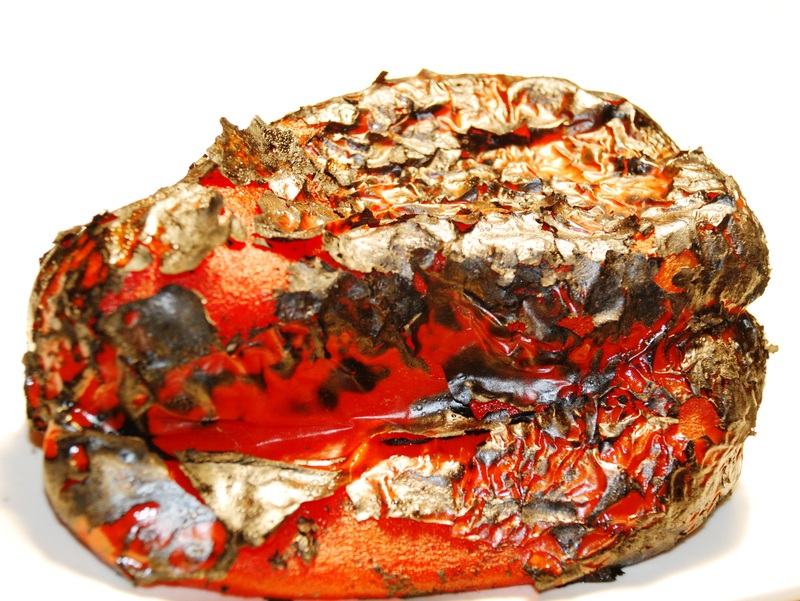 You will notice the beautiful aroma and flavor is only released when you fry or toast the shah zeera. If you do not have it by all means use the ordinary cumin, but it is worth the effort to get it, and the flavor is so much better for this dish in particular. Also you will see that the recipe asks you to make a quick dough with flour and water and seal the dish so no steam can escape out of the pot and all the flavors remain inside while it is baked in the oven. This technique is called giving “Dum” to the dish. 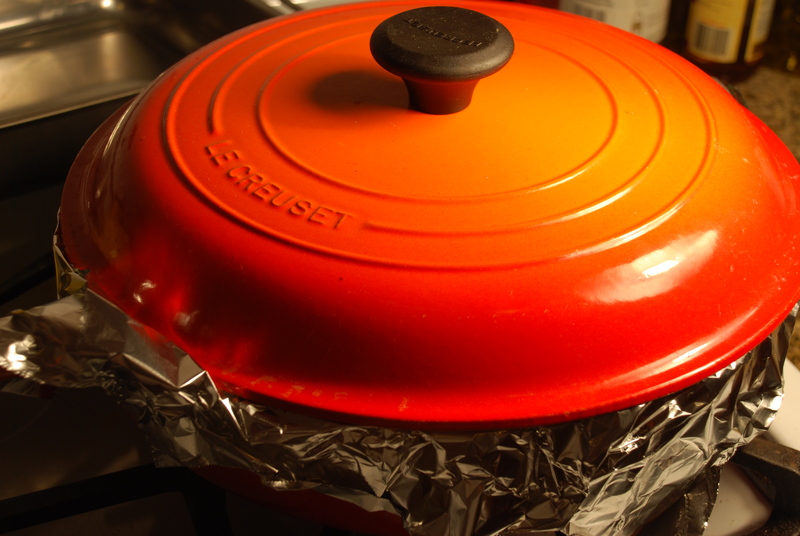 I find putting a double layer of tin foil over the edges of your pot and pressing the foil down and then placing a tight fitting lid on it does the same job. I am basicaly too lazy to make the dough and find this works just as well. I am sure the masters would not be too pleased with my antics, but hey…a girl has to take whatever timesaving short cuts she can in the kitchen. Cut the chicken into 8 pieces. 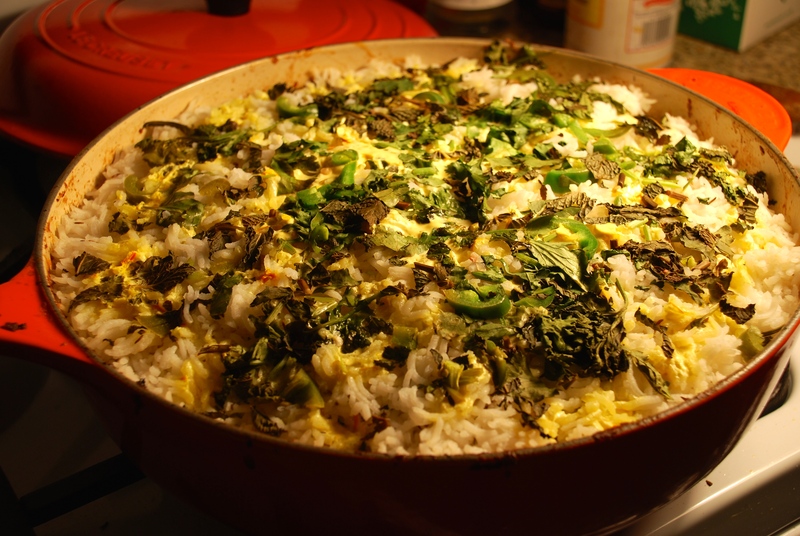 Soak the rice in a pan for 30 mins. Drain, replenish with fresh water. Add salt and half each of the whole garam masala and black cumin, bring to a boil and cook until rice is almost done. Drain. Peel, wash and slice onions. Clean, wash and chop mint and coriander. Then whisk the yoghurt in a bowl and divide into 2 equal portions. Dissolve saffron in warm milk. Add one portion of the yoghurt and mix well. Then pre-heat oven to 370ï¿½F. Heat ghee in a pan, add the remaining whole garam masala and black cumin, saute over medium heat until cumin begins to crackle. Add onions and saute until golden brown. Then add ginger paste, garlic paste and red chillies, stir for 15 seconds, add chicken and fry for 2 mins. Add the portion of the plain yoghurt, stir, add water (approx. ï¿½ cup + 4 tsp. 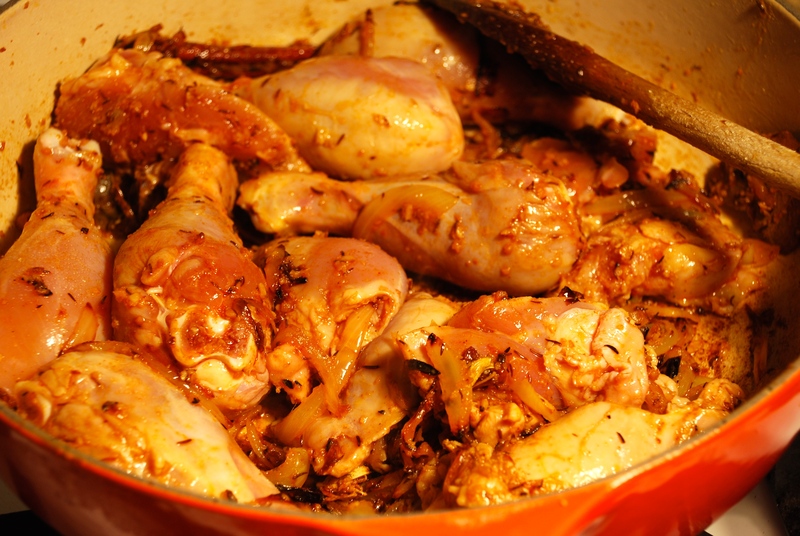 ), bring to a boil, then simmer until chicken is 3/4ths cooked. Sprinkle lemon juice. Adjust the seasoning. 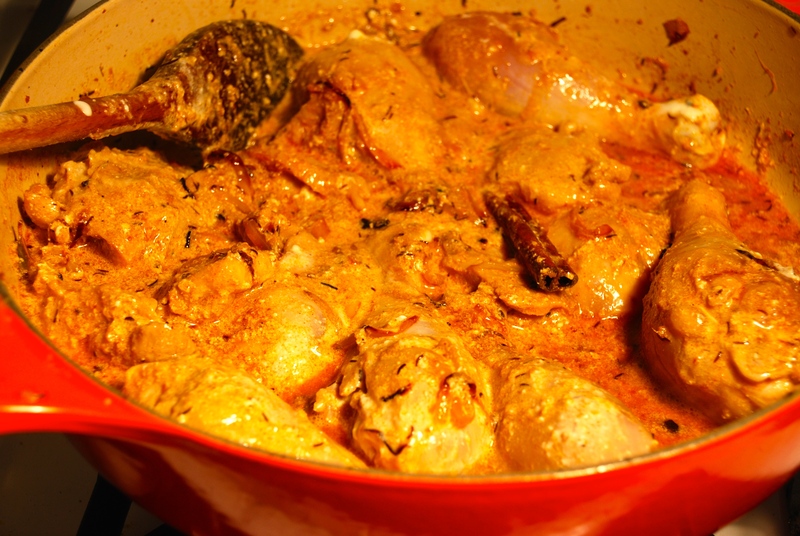 In the pan with the semi-cooked chicken, sprinkle half each of the saffron-yoghurt, mint and coriander. Then spread half the rice over the chicken. 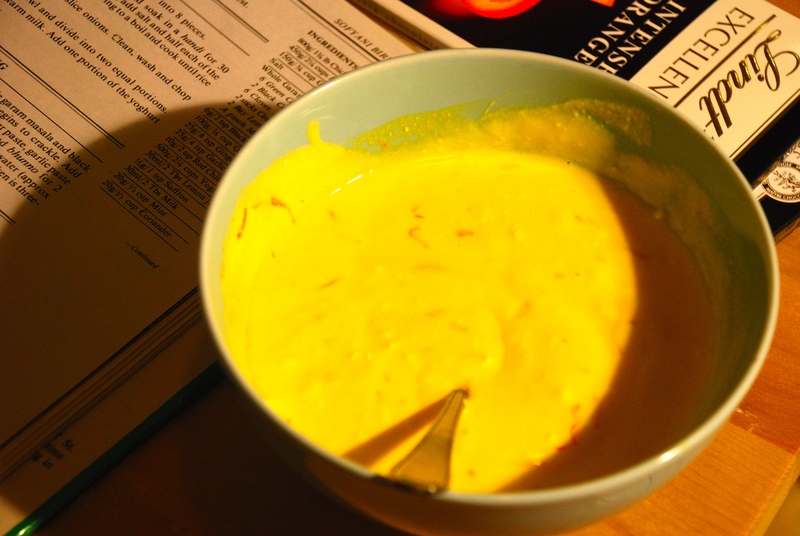 Sprinkle the remaining saffron-yoghurt, mint and coriander, spread the remaining rice. 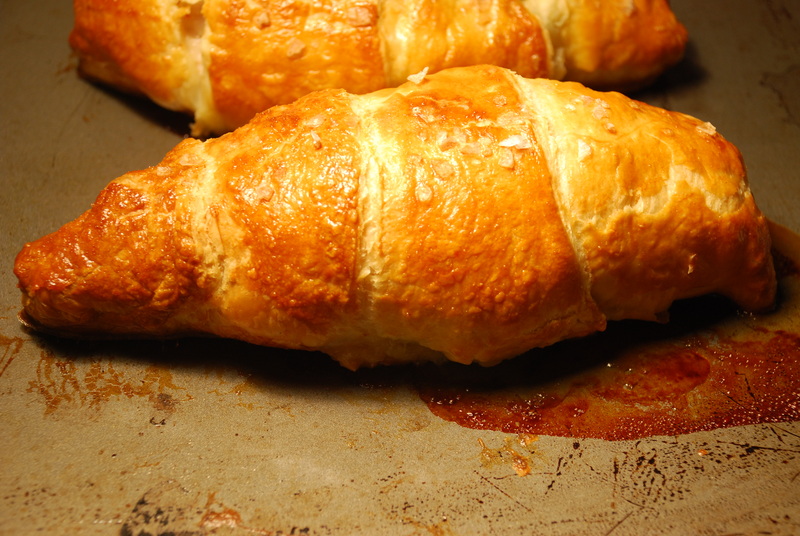 Place a moist cloth on top, cover with a lid and seal with dough. Put the sealed pan on pressure in the pre-heated oven for 15-20 mins. 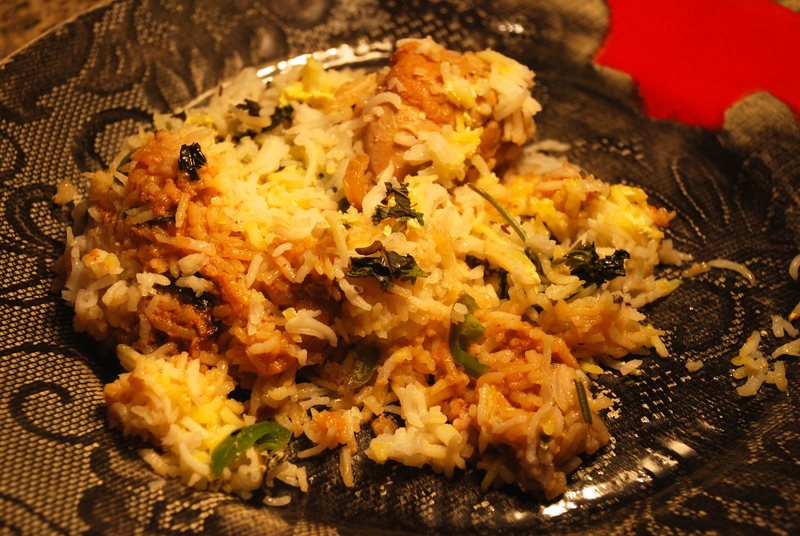 Break the seal, shift the rice from one side (just enough to remove the chicken), make a bed of chicken in a rice dish, spread the rice on top and serve. Here is a quick and tasty recipe to get back into blogging again after I got back from a month spent across the pond. 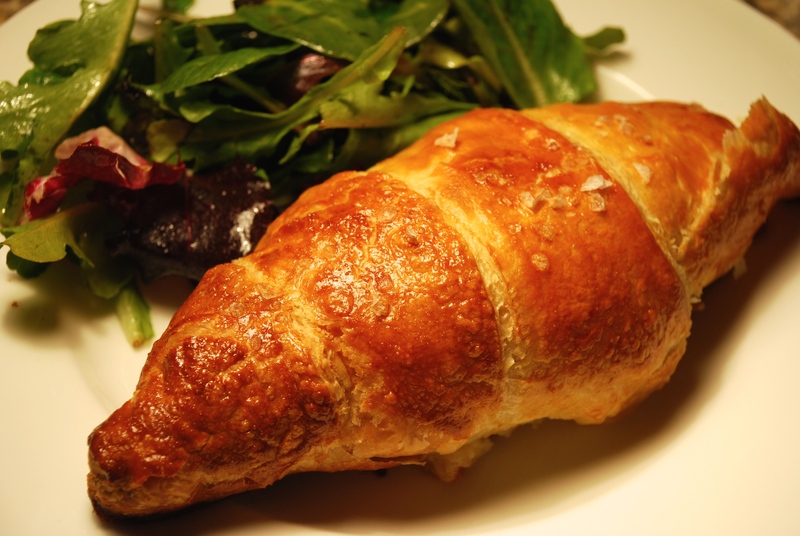 This one is nice and simple and you will have dinner ready within half an hour. The shiitake mushrooms give a nice depth of flavor and its perfect just served with rice or with another quick stir fry veg on the side. A very tasty dish with very little effort! 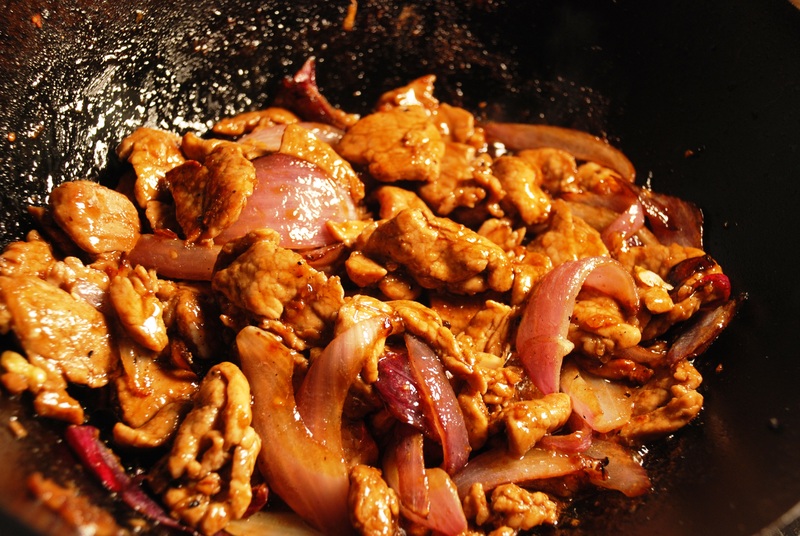 Heat oil in wok and add chicken. Stir fry until the chicken is no longer pink. Add shaoxing rice wine, and cook till absorbed. Add ginger, and garlic, cook for a couple of minutes. Add carrots, mushrooms, spring onions, chilli, water and sauces. Stir to mix well. Cover with lid and let the contents simmer for about 10 minutes. Turn the chicken over with tongs so that they can absorb the braising liquid. Add sugar for sweetness and a beautiful glazed finish. Simmer with lid closed for another 5 minutes or until the chicken is cooked. Garnish with coriander. This is one of my favorite dishes. 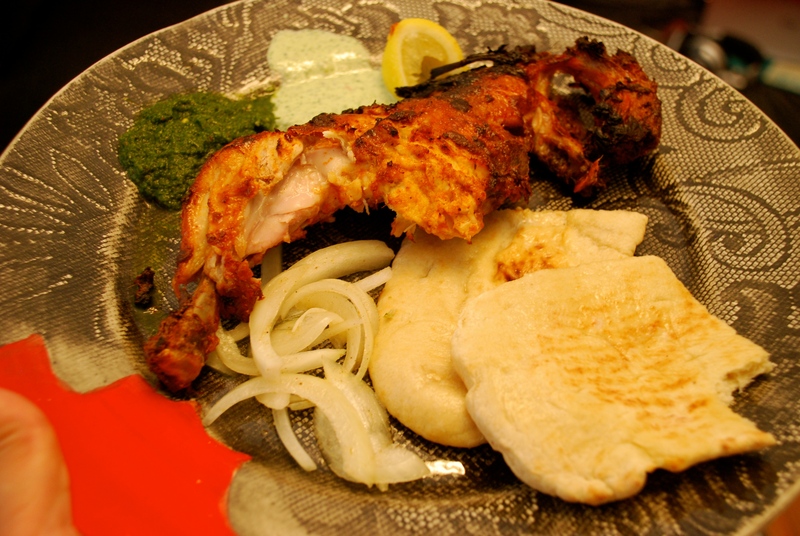 Everyone should know how to make it because it is so easy and there is nobody on earth that does not like it if they like chicken (vegetarians can try marinading paneer to make tandoori paneer)! I have recently started making a whole roast chicken rather than doing just legs or small pieces, for some reason it just tastes much better when you roast the whole chicken. 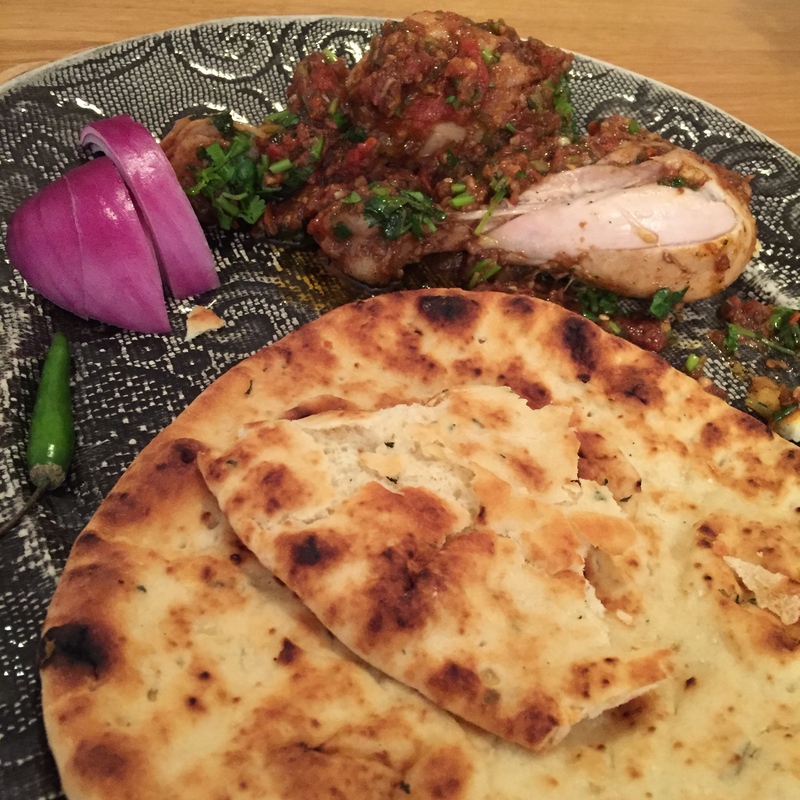 Serve the chicken with some lemon wedges along with some nice mint and coriander chutney, and hot nan bread. Of course you need the mandatory sliced onions salad (purple onions are best) which has been dressed with a bit of vinegar/lemon and salt/pepper ( or even chaat masala) if you have it. I like cooking my chicken on the chicken roaster stand, it always makes me laugh cause the poor chicken looks really silly on it, but does make it crispy and brown all over. The other thing I do is fill the baking tray underneath with a bit of water and I think it keeps the chicken really moist. Also, remember to use big cloves of garlic or add more if your garlic cloves are of the tiny variety, I use 5-6 really big fat cloves, the whole flavor comes from the ginger and garlic and you must not feel shy with them. I have left my chicken to marinade in the fridge for unto 48 hours and have to say it tasted amazing, the smells of the ginger and garlic had gone into every part of the chicken and it just had great flavor. So you can be pretty flexible, just don’t do it for less than ten hours. Wash and pat dry your chicken with paper towels. Peel and discard the skin from your chicken, paper towels come in handy to get a grip and peel the skin off. 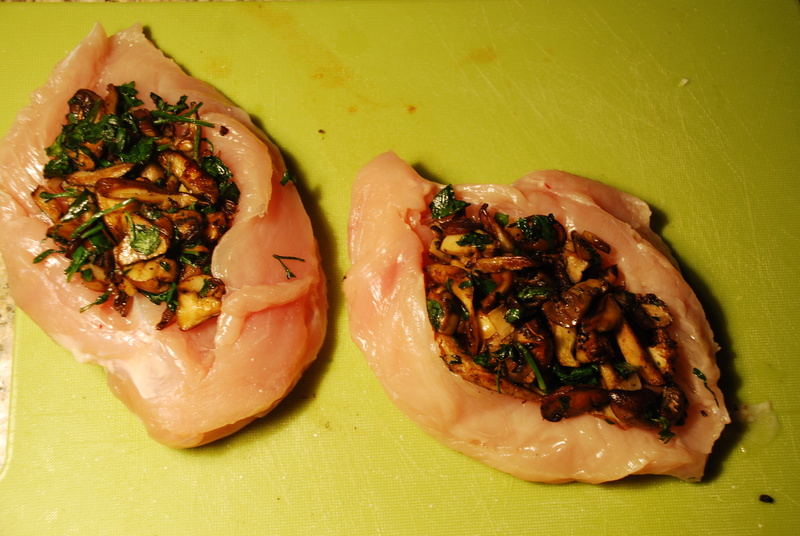 Cut some slashes on the legs and the breast of the chicken, so the marinade can really get in there. Rub the chicken with lemon juice and salt. Also get a little juice and salt in the cavity. Leave for 10-15 minutes. In a small blender, throw in your ginger, garlic and juice of lemon and green chillies and blend till a paste is made (does not have to be too fine a paste). Mix the paste with the yoghurt in a separate bowl and add the paprika and the garam masala and a teaspoon of salt. Mix really well, taste and season. 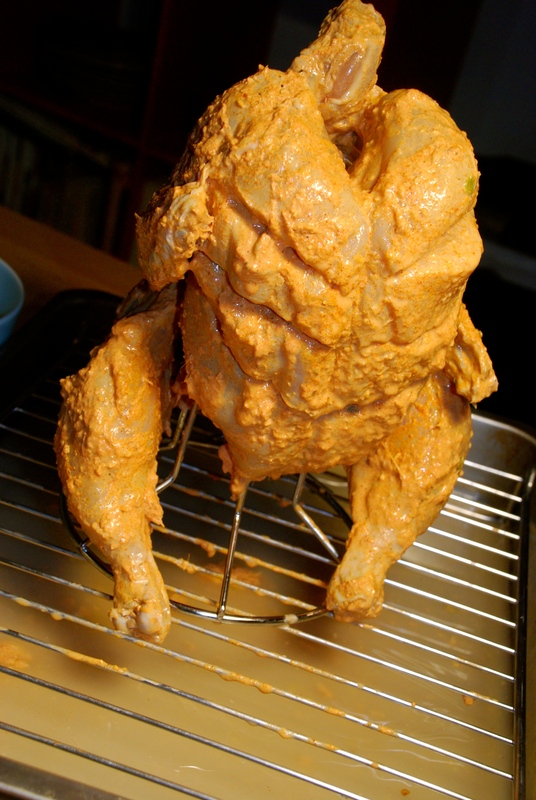 Place the chicken in a large enough zip lock bag and pour in the yoghurt marinade and close the bag. Ensure you get the marinade all over the chicken by rubbing/massaging the marinade into the chicken by squishing the chicken in the bag with your fingers. Make sure it gets everywhere and coats it well. Leave this to marinade in the fridge for 24 hours. 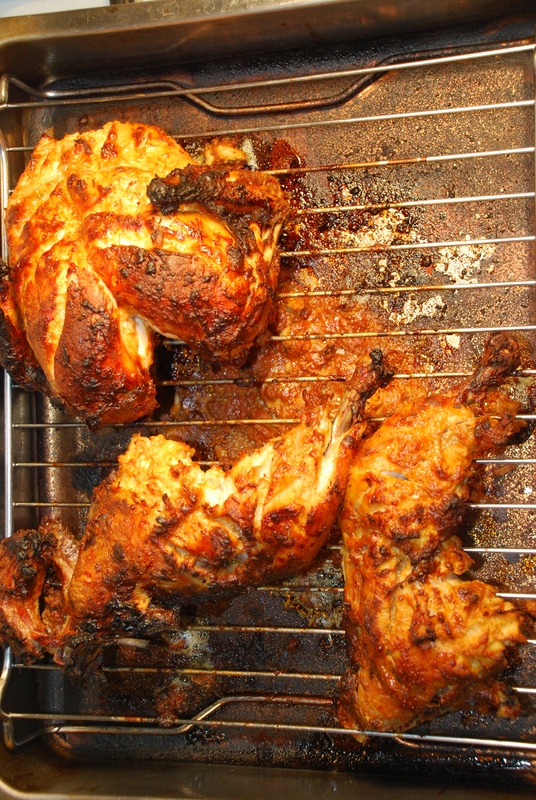 Take the chicken out of the fridge an hour before you are going to cook so it comes to room temperature. 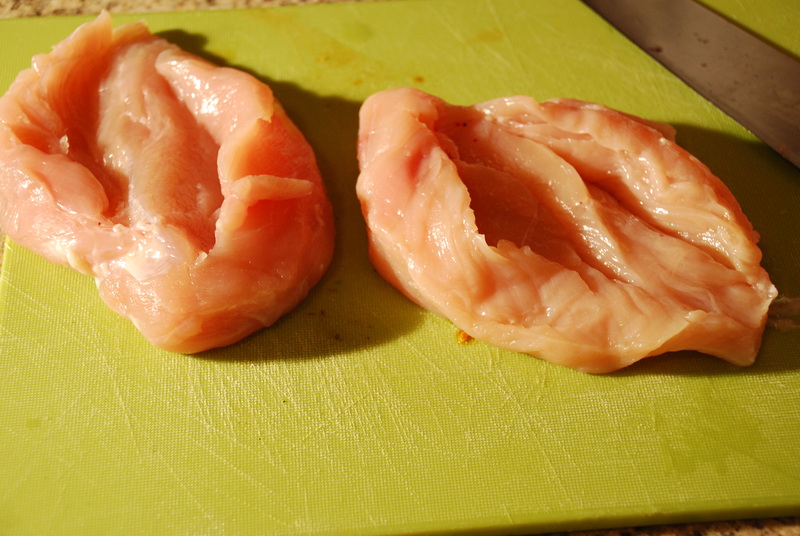 Preheat oven to 190ºC/375ºF/gas 5, and bake your chicken for 45 minutes or till juices on the thigh run clear. If it looks like it needs some charring then, let it broil under the grill for five minutes or so ( you could brush it very lightly with a some oil before broiling). An amazingly delicious chicken recipe, which I love so much I always make sure I have marinated extra chicken so I can have it again the next night! Oh, and did I mention my gorgeous husband can’t get enough of it either! 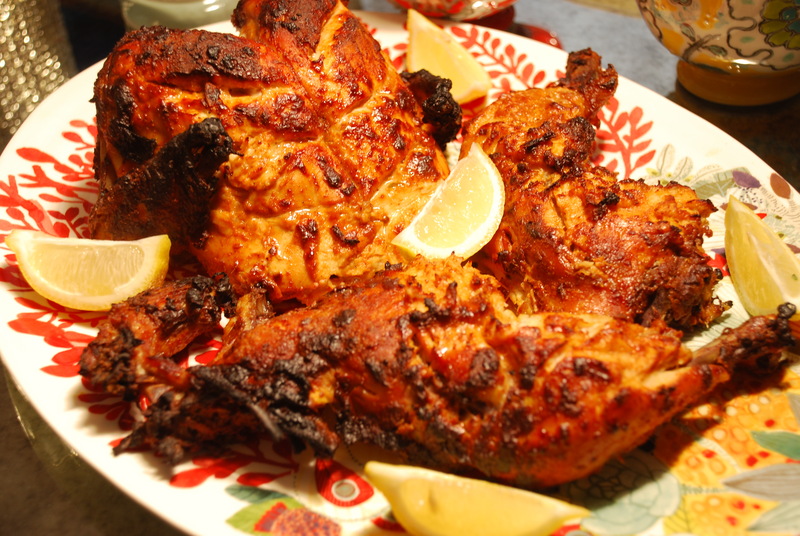 The buttermilk marinade does wonders to make the chicken really juicy and full of flavor. The crunchy crust with the juicy chicken and the yummy flavors all come together and create a huge party in your mouth. I use Japanese style panko breadcrumbs for this and feel they make the chicken extra crunchy, but you could use fresh breadcrumbs if you like. I love adding Mc Cormicks Applewood Rub to the breadcrumb mixture, as it gives it a nice background smoky flavor, but if you don’t have any then it will also taste great without it. I l serve this with a lush sour cream and mayo sauce flavored with dill and garlic, really a little of this dabbed on each mouthful makes the experience complete. Accompany this with a nice salad and you don’t need much more. This recipe is based on the recipe from Nigella Lawson’s book Kitchen, my version ups the amp on flavor with the addition of garlic and few key ingredients that I feel truly make it sing. Do give it a go and you shall not be sorry! 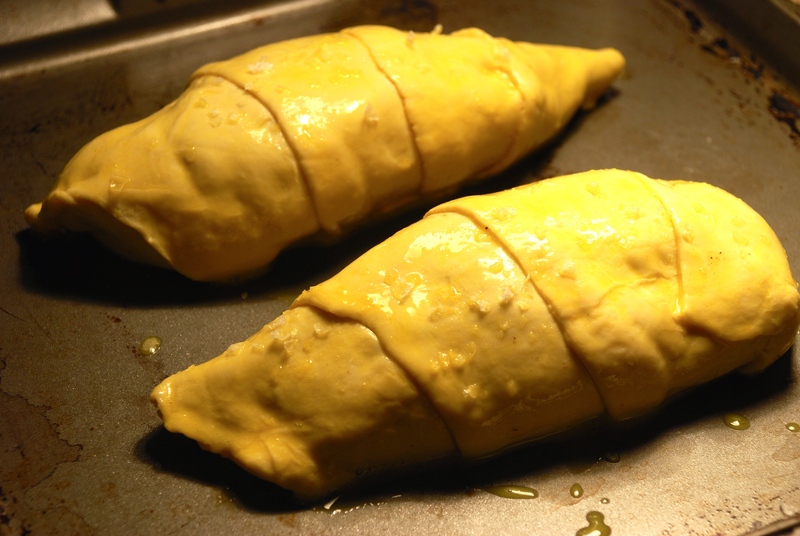 ♥ Unroll a large piece of clingfilm, lay the chicken breast filet on it and cover it with another layer of clingfilm. Bash it with a rolling pin until they are thin, but still whole. 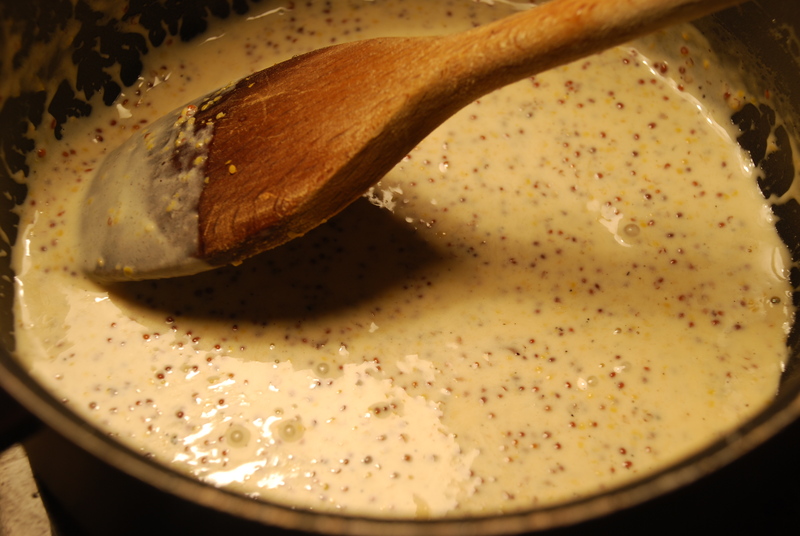 ♥ Whisk the buttermilk with the, crushed garlic, pepper and Worcestershire sauce in a shallow bowl (or put in a freezer bag and mix). Then add the flattened chicken to the bowl (or into the freezer bag) and leave out for at least 30 minutes preferably overnight. ♥ Mix the panko breadcrumbs, celery salt, cayenne pepper, herbs and Parmesan and applewood rub in a wide shallow dish. Then lift out the buttermilky chicken and press into the breadcrumb mixture one at time and lay them aside onto a wire rack or plate. Pat the crumbs in nicely over the chicken to make sure you get a good coating. ♥ Heat the oil and fry bigger pieces for about 3 minutes per side and smaller pieces for about 2 minutes per side. 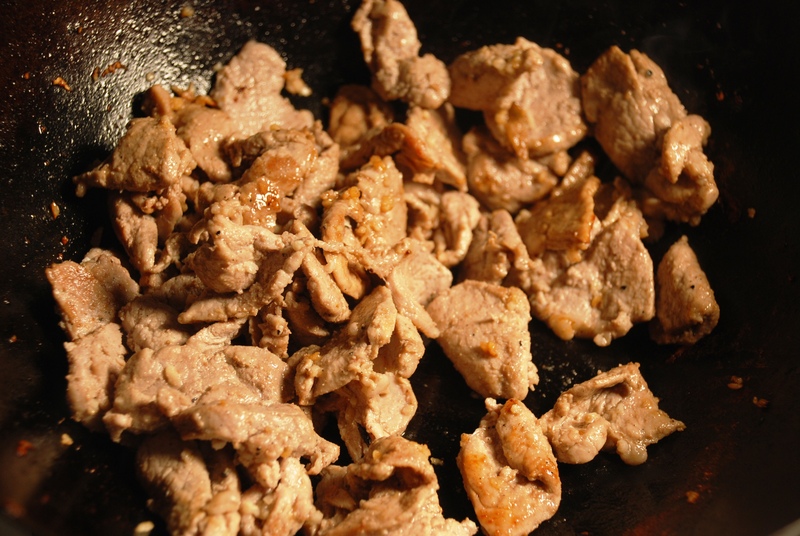 As you remove the cooked chicken, blot them on kitchen roll. Add fresh chopped parsley if you like. ♥ Combine all the sauce ingredients, taste and season. Chill till you are ready to eat. Take out of fridge 15 minutes before you eat so it’s not too cold. This is a sweet and spicy, super tasty and really quick to make Thai dish which my husband and I totally love. If a few weeks go by without making this, I can be sure he will ask for it soon! It is great served with a bit of jasmine rice and a sharp dish like a green papaya salad or even a quick stir fried veg. It is really so good that if you make it once, you will make it forever! So do make it and add one more dish to your culinary arsenal! It is also great that you can cook and keep it in the fridge and reheat later. But it’s so fast to make that you may as well just make it before eating! I am sure this would also taste really good with chicken if you are not such a fan of pork. I also like to keep a box of deep-fried onions in my kitchen cupboard (which you can pick up at the Thai/Asian grocery store) and sprinkle a tablespoon of them on top and add that nice crunchy texture. They are very convenient to have for someone like me who will never make deep-fried crispy onions. They also sell deep-fried garlic like that which I also like to have around! It does taste better with palm sugar, so I would pick that up at your local Thai grocery, but it would still be fine to use brown sugar if you can’t be bothered. This recipe is from the best Thai cook book I know (and I have a few), it’s called “The Food of Thailand, a journey for food lovers” and is published by Murdoch books. 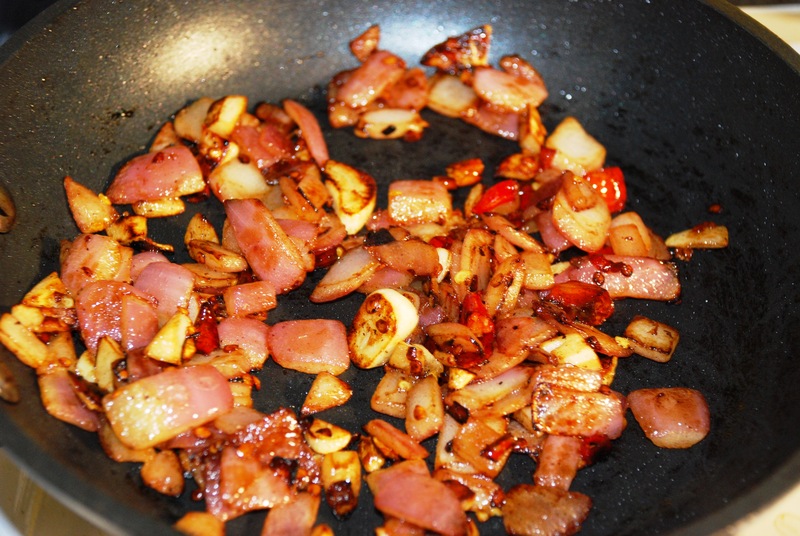 Heat the oil in a wok or deep saucepan and stir fry the shallots or onions till they are golden brown. Be careful not to burn them. Remove from oil and drain on paper towels. Keep the wok heated and stir-fry the garlic in the oil till light brown, then add the pork and stir fry for a few minutes. 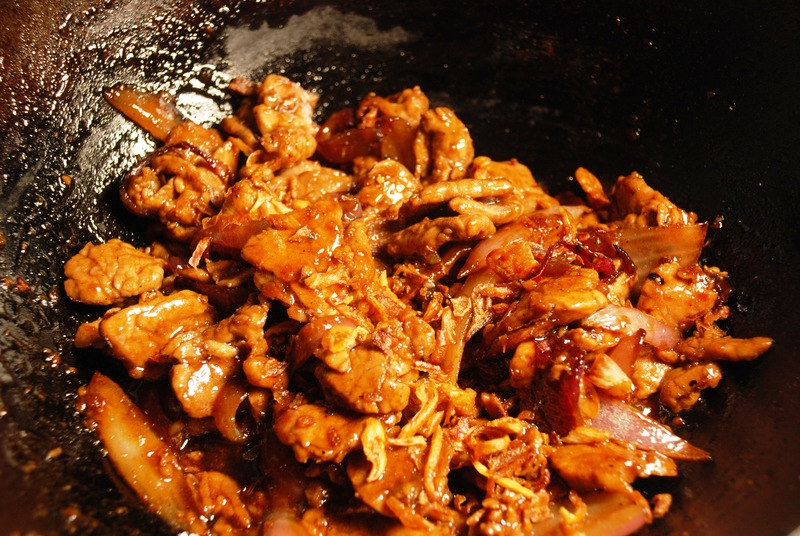 Add the oyster sauce, light soy sauce, fish sauce, sugar and ground white pepper and continue cooking for about five minutes, or until all the liquid has evaporated and the mixture forms a thick sticky sauce. 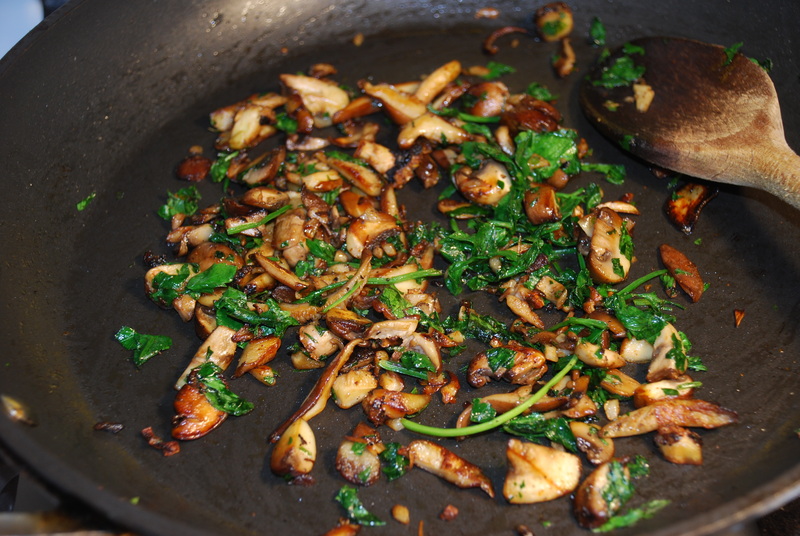 Spoon onto a serving plate and sprinkle with crispy shallots or onions. Serve straight away or reheat later and serve. Enjoy!!! Well, I am finally back! I was away travelling the last couple of months around Ladakh, Mumbai, Kuala Lampur and then a couple of weeks in London. 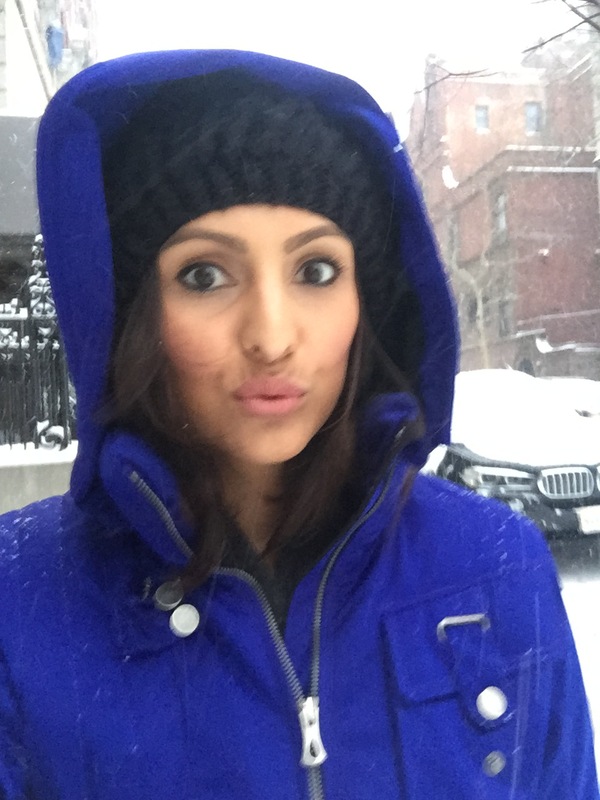 Happy now to be home in NYC! 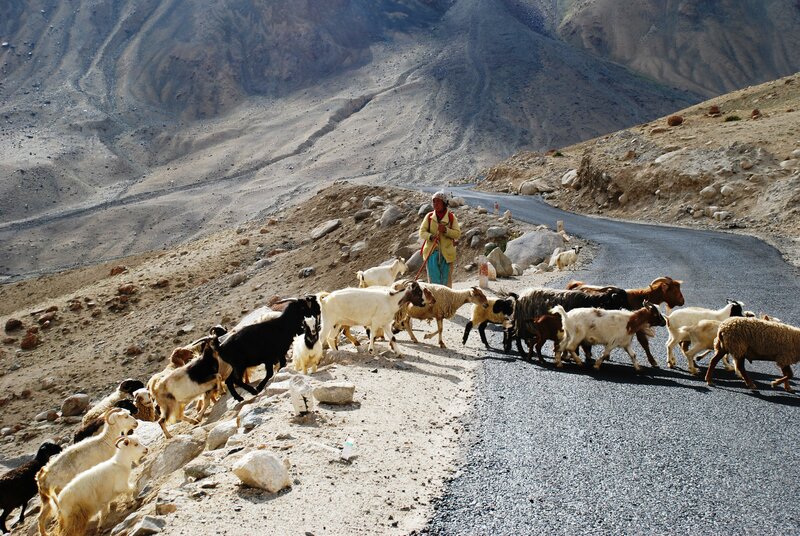 For those of you who have not been to Ladakh yet, get yourself up there! 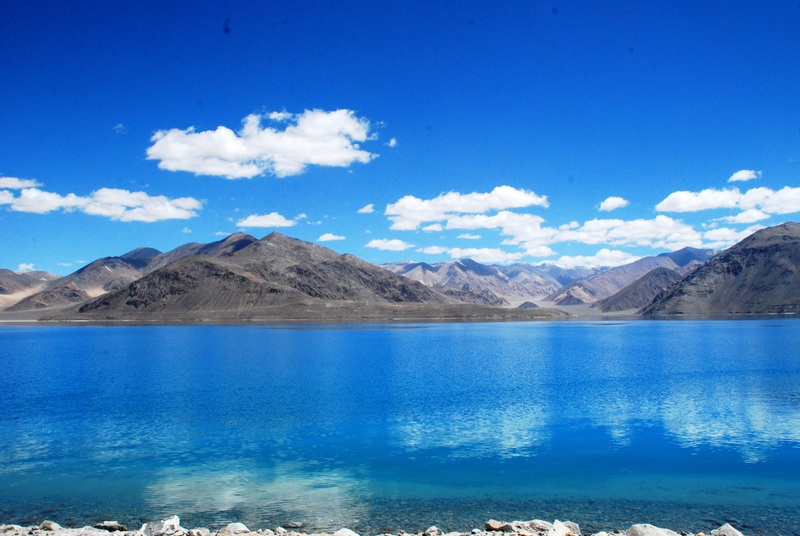 It is a stunning part of India on the border of Tibet. The scenery is just spectacular, its rugged beauty will astound you, making you feel like you are on the moon at times! On my stay in London I was very happy to pay Ottolenghi’s Nopi a visit with some good fiends, as usual they offered up some real in your face flavors. Upon returning home, I found myself still in a very Ottolenghi inspired mood! So I decided to try out his extremely tantalizing harissa-marinated chicken with red grapefruit salad from Ottolenghi The Cookbook. I had never made my own harissa before, this one is Tunisian and turned out nice and smokey, very different to the Moroccan harissa I usually have which is a lot more lemony with the preserved lemon flavors quite strong.The grapefruit, lemon and maple syrup sauce smells divine and glistens beautifully, effortlessly making your mouth water. It tastes simply amazing, almost like sunshine! Really makes the whole dish come alive by allowing the citrus flavors to mingle nicely with the smoky flavors of the harissa and make the dish truly sing. 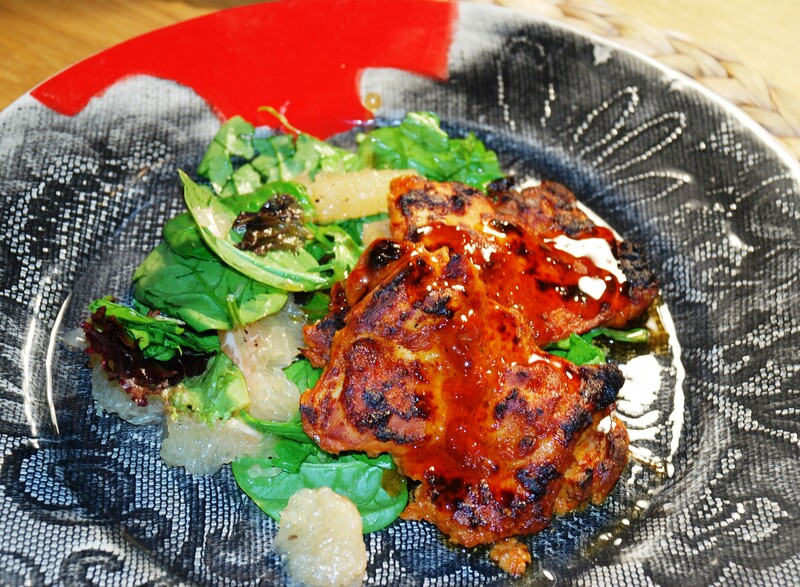 The left over chicken tastes really great the next day wrapped up in a pitta with some hummus, chilli paste, onions, salad leaves, and of course with lashings of the tangy gorgeous grapefruit sauce drizzled over the top. I think the extra sauce could be used to make dressings for salads too, it is so tasty you want to eat every last drop of it. 1 First make the marinade for the chicken. 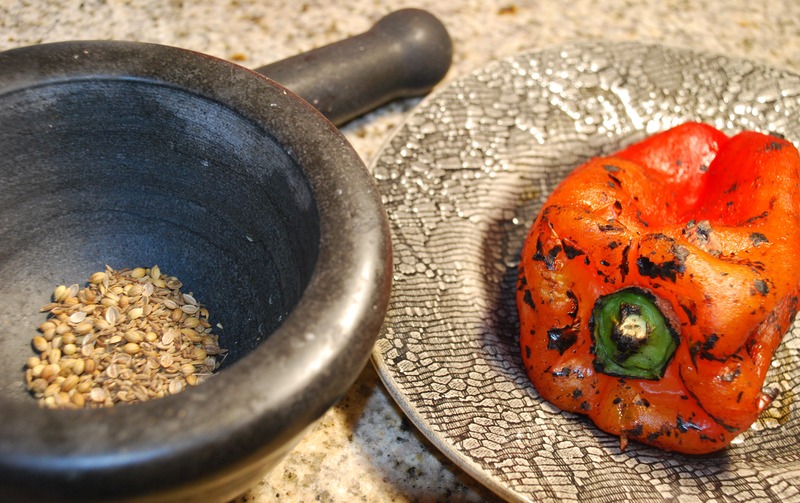 Over a gas ring or under a very hot grill, toast the red pepper until blackened on the outside. This should typically take about 8 min on an open flame, 15-20 min under a very hot grill. Place the pepper in a bowl, cover with cling film and leave to cool. Peel the pepper and discard the seeds. 2 Place a dry frying pan on a low heat and lightly toast the coriander, cumin and caraway seeds for 2 min. You should be able to smell the aromas of the spices. Transfer them to a pestle and mortar and grind to a powder. 3 Heat the olive oil in a frying pan, add the onion, garlic, and fresh and dried chillies and fry until they turn a dark, smoky colour. 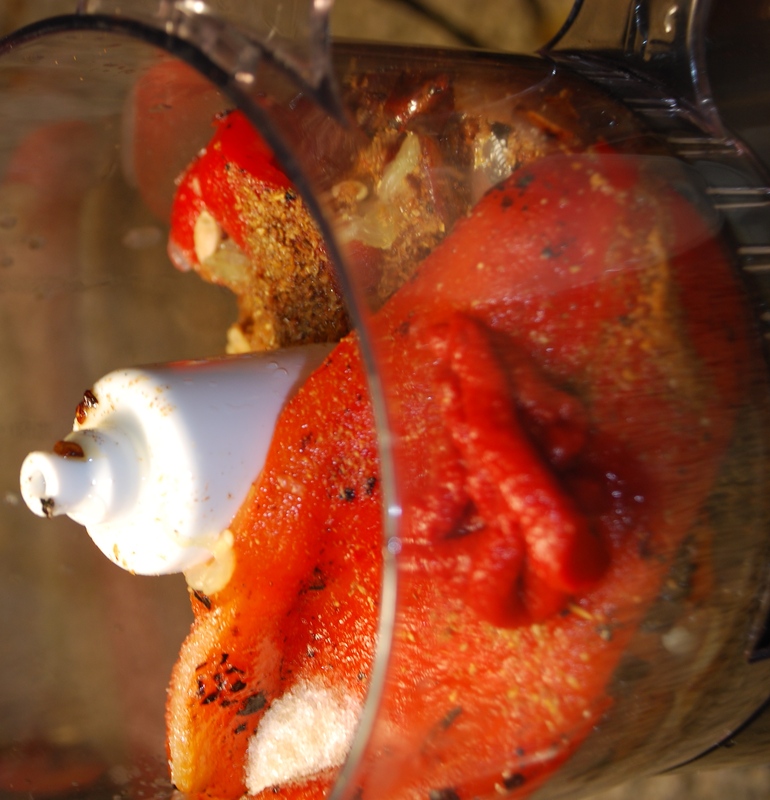 Now blitz together all the marinade ingredients except the yogurt in a food processor or blender; you will have a pure harissa paste. 4 To marinate the chicken, mix the paste with the yogurt and use your hands to rub it all over the chicken thighs. Layer them in a plastic container, seal and refrigerate overnight. 5 The next day, take each grapefruit and use a small, sharp knife to slice off the top and tail. Now cut down its sides, following its natural lines, to remove the skin and white pith. Over a small bowl, cut in between the membranes to remove the individual segments. Squeeze any remaining juice into a bowl and keep to make up the 150 ml juice required for the sauce. 6 Preheat the oven to 220 degrees C. Lay out the marinated chicken pieces, spaced well apart, on a large baking tray and place in the hot oven. After 5 min, reduce the oven temperature to 180 degrees C and cook for another 12-15 min, until the chicken is almost cooked. Now place the chicken under a hot grill to give it extra colour and cook it through completely. 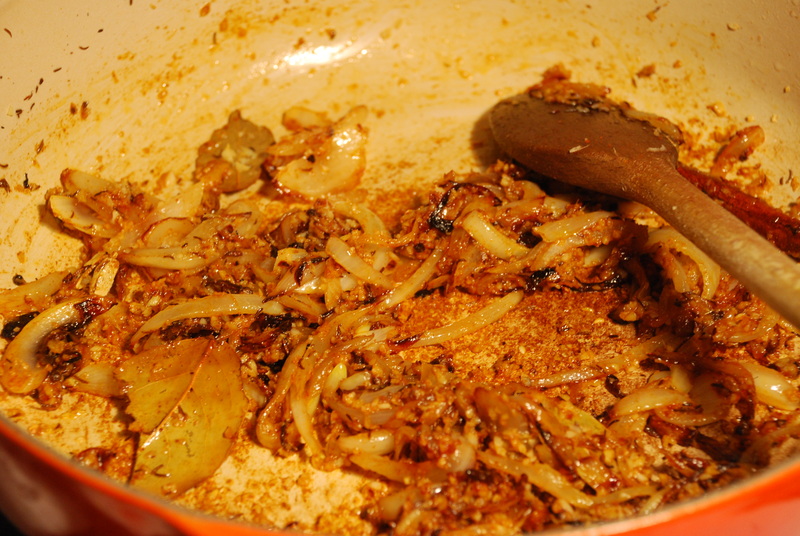 7 Meanwhile, place all the sauce ingredients in a small pan and bring to a light simmer. Simmer for about 20 min, or until reduced to a third. 8 To serve, toss the rocket and grapefruit segments with the olive oil, salt and pepper, Pile in the centre of 4 serving plates, put the warm chicken on top and drizzle about a tablespoonful of the sauce over each portion.